The translation of THOR from Asgard to the big screen may prove to be the biggest challenge that Marvel Studios will face in its ambitious AVENGERS project. Granted, getting a human hunk of flying iron, a gamma-green behemoth, and genetically altered hero of WWII all into the same contemporary world is no small feat, but we are talking about a mythological god here. The announcement of director Kenneth Brannagh as THOR’s director was met by a good deal of surprise and countless questions. Not the least of these was whether he’d bring along his long-time collaborator, PATRICK DOYLE, back into the breach. The thought of it was just full of the most electric of potential. 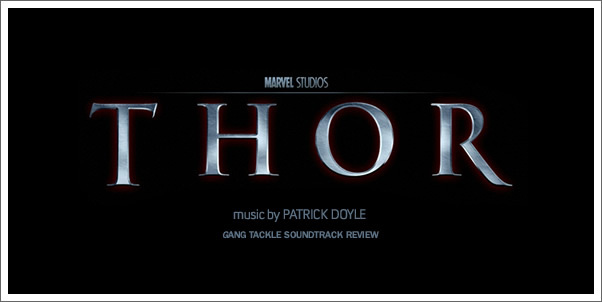 In THOR, Brannagh delivers a distinct Shakespearean edge to the Nordic triangle of power: Odin, Thor, and Loki, while simultaneously providing an approachable, contemporary world of New Mexico, which has just seen its first visitor from another world (at least outside of Roswell). We're then left with the question, "Just how well does Patrick Doyle's score perform in, as well as connect, those worlds?"